In the year After Colony 195, a group of mad scientists is enacting Operation Meteor as retaliation against the OZ military organization. Each of the five rogue scientists has trained a teenage boy to take part in the operation by piloting a “Gundam”, which each scientist has uniquely designed. These Gundams are the most advanced military technology yet, and they're on the precipice of changing the world forever. But will that change be for the better, or will it trigger another wave of military destruction? That all depends on the Gundam pilots themselves. Gundam Wing was one of the first anime I ever saw, and I'm not alone. When the show first aired on Cartoon Network 's Toonami in 2000, it created a wave of brand new-anime fans who are now in their 20s and 30s today. 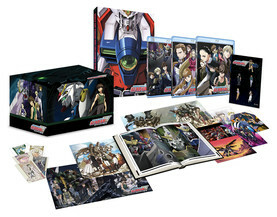 In December 2017, a stunning new “Collector's Ultra Edition” blu-ray box set gave older fans the opportunity to rewatch this show with fresh eyes, and newer fans now have the ability to discover Gundam Wing with the crisp video quality that we've come to expect from anime today. Retailing for $242 at Right Stuf , this boxset is banking on fans opening up their wallets for nostalgia. This anime captured the imagination of a generation of anime fans almost 20 years ago. But just how well does it hold up today? It turns out the show that made me a fan of the Gundam franchise —and of anime in general—is kinda just okay. A sharp blu-ray transfer and clean PCM audio make it look and sound better than ever before, but they can't transform the winding story, old-fashioned art, or dated action sequences to fit modern expectations. The first thing you will notice is how crisp this show looks now. As its powerhouse opening “Just Communication” pours through your speakers, the visuals are bolder than ever—and you may even notice new details that are only apparent on blu-ray, like background characters and new design elements on the Gundams. However, this transfer couldn't make the plot any more clear. When I was 13 and watching the series for the first time, I just figured I didn't understand the plot of Gundam Wing for the same reason I had trouble following along in history class—it was just too complex a level of political intrigue for me to follow. Fast-forward 18 years, and this show is just as inscrutable as ever. Watch as Zechs switches sides (and identities!) following his own agenda while Dorothy betrays one person after another for reasons I'm still foggy on. Beg for scraps of characterization that might make characters' motives more coherent. It's frustrating how little the characters' personalities shine through, especially when it comes to the Gundam pilots themselves. Did I only recall Duo as sassy and Wufei as rebellious from the fanfiction I read around that time? One big surprise for me was the unexpected strength of Relena. I didn't like Relena during my first viewing because I thought she was too sentimental, but now I see that her optimism and stubbornness play a vital role in what could otherwise be a dark story full of nihilist characters who have either given themselves over to war completely or no longer believe in anything at all. She's the only character who truly grows in Gundam Wing , transforming from a simpering Heero fangirl (remember that iconic scene in which he tears up her birthday invitation and promises to kill her?) to a confident head of state. If this is anyone's story, it's Relena's. Still, it's hard for anyone to maintain much momentum through these 49 episodes. With five Gundam pilots, a quasi-love interest for each, five rogue scientists, and a handful of additional vital opponents and authority figures, the story switches between a dozen points of view. Often a single episode will swap between significant but mostly unrelated events, as different characters deal with their outcomes. The pacing is pretty quick as a result, especially for a show this old, but it's rare that these rabbit trails pay off. As with other long serials of the time, Gundam Wing could have been told in a much shorter time-frame by limiting itself just to key conflicts, and it kind of overstays its welcome at 49 episodes. For this reason, Gundam Wing: Endless Waltz , the show's three-episode sequel that also comes with the blu-ray set, is much stronger because it's limited to only the material with the biggest final payoff. Sunrise 's art and animation were already striking even in the '90s, but they're enhanced a lot by the blu-ray transfer. The style and level of animation are of course dated, and newer fans in particular will notice that TV production look a lot glossier today. This is most apparent in the Gundams themselves. Their designs are iconic at this point—when I interviewed the head of anime figure distributor Bluefin in 2016, he said that Gundam Wing model kits continue to be top sellers even now—but there isn't anything special in the way they're animated. Their fights are often repetitive, and it can be hard to tell what's going on. Stilted movement on top of a color palette prone to darker shades is often the culprit. Much like the musical score, the dub transfer is sharp. Both the English and Japanese dubs are original from when the show first aired (2000 in the US, 1995 in Japan). That means the range of expression and vocal direction can be pretty lacking. I watched it with the Japanese dub since that wasn't available when I was 13 (and neither were the amazing opening and bizarre closing). So although this was a nostalgic watch for me, in some ways the audio also made it feel brand new. Gundam Wing marked a watershed moment in anime fandom history. It deserves a massive and excessive box set like this one, which comes with a 180-page art book full of interviews and exclusive sketches, three posters, five art cards, five metal pins, and even Gundam Wing -themed tarot cards of all things. Certain types of fan will absolutely want to be reaching for their wallets: the ones who saw Gundam Wing as a teenager the first time around and want to remember that era. It's the best possible remastering of this so-so show that somehow launched a new generation of anime fans. Just don't be surprised if it can't hold the interest of your newer anime fan friends.